Posted on June 7, 2013, in Twelve Steps in Everyday Living and tagged Addiction, Alcoholic Anonymous, Amends, God, Higher Power, Recovery, Self-Help, Sobriety, Step 9, Substance Abuse, Support group, Twelve Step, Twelve-Step Program. Bookmark the permalink. 18 Comments. You brought back a memory for me. I remember one amends rather clearly. I was beyond scared to make it and almost talked myself out of doing it. It changed my relationship with my brother-in-law. We have never been closer. I would have missed out on a lifetime of enjoying my family had I not done it. I love posts (and shares) on Step Nine. We are really stepping into life when we get through these. Good job! Thanks, Lisa, I pray for you every morning, and I hope you are doing well! I, too, am blessed, any of the amends I have completed went beautifully, and each relationship is the better for it. I just need to get moving with the rest of them! Great to hear from you, as always! Michelle, thank you so much for saying this. I wanted to talk about living amends, because they are such a big part of this for me, I might have to do another post! I couldn’t agree more, and I do appreciate your reading, and your commenting! Good stuff! 9 is much scarier than 4 to me! I love the concept of living amends as well, like Michelle. It’s almost like righting our karma. Oh, don’t forget your miracle today. How about 5 badass days of exercise in a row?!? Woo-hoo! Hi C! 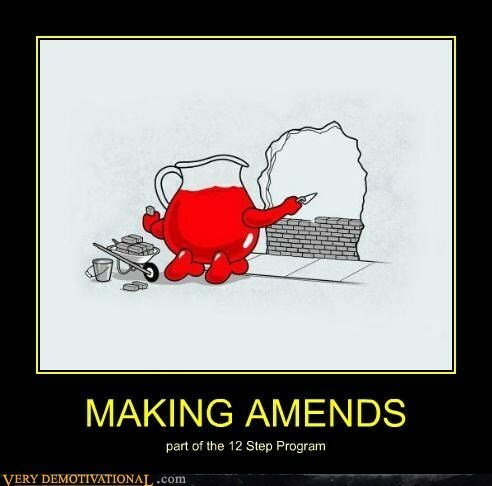 Thanks for commenting, as I mentioned to Michelle, it completely slipped my mind to talk about living amends, and I am bummed, because it is such an important part of this step! I am going to have to do a follow-up! Thanks, Mrs. D! Step 9 is definitely not for the wishy-washy! Thanks for stopping by! So true! Step 9 is my favorite step. I never thought I would say that, but the freedom I feel afterwards is like no other! Simply amazing and extremely humbling. I’ve always thought it would be great if everyone could do a ninth step regardless if they’re an alcoholic or not! Thanks for the feedback, Chenoa, it’s great to hear from you! My sponsor basically told me i had one week to do my amends for the people that live here in Yeaman. i was so stressed about the logistics required to do it, that i didn’t have time to secodn guess or over-think the step! This summer, though, i’ll do my amends for family in the States during my summer vacation… i think i’ll try the ‘you have one week approach’ and see how that works there. And, Al, thank you for sharing yours. I have told the story of your amends to the insurance company quite a few times in the meetings I attend. It is, hands down, the most courageous step 9 story I have ever heard. You are my step 9 hero! J reminded me… Did you ever hear back from the insurance folks Al? Just curious. My guess is no (they probably had no idea how to handle or reconcile it). You’ll have to excuse my absence here in this wonderfully refurbished blog (awesome – can smell the new paint still) – life’s been keeping this alkie busy. Step 9 – oh dear. What to say? You laid it out pretty clear, as the BB would have us do it, and for the reasons we do, and you do a great job in the nuts and bolts of it. I too haven’t finished mine – have a handful left (have had a handful left for a very long time now…ugh). Ego, comfort, fear…pick one, pick more, pick em all – they keep me from being even freer. BUT, the amends I have made…oh man, how cool have they been? Very, is the answer. I have had nothing but great experiences so far, and yet, it’s sometimes just difficult to bring yourself to yet another table to make the amends. But it works, and wish that even non-alcoholics and addicts could do it. Very refreshing. I wouldn’t say it’s my fave step, but it has brought about dramatic changes, in terms of seeing things from the past and just making things right. I have to be careful to not lump things into a “living” amend so that it’s easier for me. There are certainly some that I cannot do because of harm, so I choose to live a life differently than I used to, in terms of specific things. But I found myself sometimes trying to squeeze a direct amend into a living amend, and finding myself uncomfortable doing it. So I have to make it direct. Blech. ha ha. But that’s how it is…and can’t wait until all my conscious amends are done and I can move on. But it’s a good thing, and I know that when I do get the next few off my plate, I will be a happy camper. happier, that is. Paul, thank you so much for your always insightful comments. And if you ever do this series on your own blog, you can just come back to mine and read your comments… it will practically write itself! Thanks for noticing the change… I am so blessed to have a media manager for these mundane tasks (I am completely kidding about the mundane task, and I am forever grateful for my husband for keeping me even marginally relevant in this blogging world!). I noticed you changed it up as well… once again, we are in sync! Hope the stuff keeping you busy is also keeping you happy! Thanks for the inclusion in your blog!